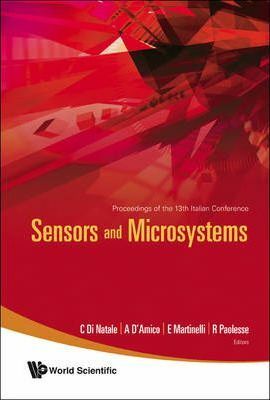 This book collects a number of papers presented at the 13th Italian Conference on Sensors and Microsystems. It provides a unique perspective on the research and development of sensors, microsystems and related technologies in Italy. Besides the scientific value of the papers, this book offers a unique source of data to analysts that intend to survey the Italian situation on sensors and microsystems. Development of Label Free Genomagnetic Electrochemical Sensor (M Morvillo et al. ); Portable Bio-Amperometer for Photoactive Biomaterial Monitoring (G Pezzotti et al. ); Borders Effects in Gas Sensors and Thermistors (A D'Amico et al. ); Study and Application of Chemical Sensors for Environmental Monitoring (L Capelli et al. ); Progress Toward a Proton Computed Tomography Apparatus (D Menichelli et al. ); Pressure Sensor Based on Saw Resonators (M Benetti et al. ); Optical Fiber Spectroscopy for Measuring Quality Indicators of Lubricant Oils (A G Mignani et al. ); Compact Optical Sensor for Multispectral Image Spectrometry (A Piegari et al. ); Localization of Sensor Networks using Ultrasounds and Radio Frequency (R Carotenuto); New Role for Sensors in Energy Management Systems (G Mauri et al. ); An Oscillator Topology as Wide Range Resistive Capacitive Sensor Interface (A De Marcellis et al. ); and other papers.